Is your pain in left arm heart related or not? Causes, symptoms and diagnosis! Why does your left arm hurt in case of a heart attack? When to see a doctor and what to expect? 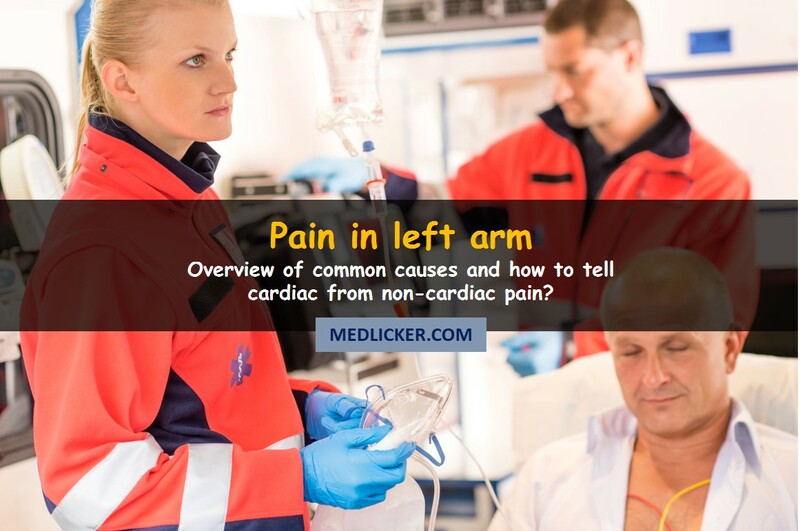 How to differentiate cardiac left arm pain from non-cardiac pain? Therefore, it should not be ignored or overlooked. This article describes some of the most common causes of left arm pain and explains the difference between the cardiac and non-cardiac type of pain. The relation between left arm pain and a heart attack is quite simple. The nerves that supply your heart and left arm arise from the same nerve root in the spinal cord. Whenever a heart attack occurs, the nerves that supply the heart take the pain signal to this common nerve root in the spinal cord. This spinal cord nerve root then refers the pain signals towards your left shoulder and arm (and sometimes also to other areas of the body, such as the jaw or groin). That is why you may feel pain in your left arm (as well as jaw or groin) when you have a myocardial infarction. But does that necessarily mean that any ache in left arm is always heart-related? In fact, there are many reasons why you may get a pain in your left arm and its intensity varies widely from mild pain, through dull pain to persistent shooting or throbbing pain. And not only your arm is affected. Left shoulder pain, underarm or upper arm ache are also relatively common. It is true that among all causes of left arm pain, heart-related pain is the most serious one (1, 2). But nothing can be said with certainty about the possible cause of pain in left arm unless you go to see your doctor and get your ECG and blood examined. So, whenever you get a pain in your left arm, shoulder, underarm or even your wrist, palm or fingers do not ignore it and get a medical checkup just to exclude the risk of a heart attack. Here is an overview of the most common causes of left arm pain. The most severe condition, which may be accompanied by pain in your left arm, shoulder, underarm or wrist is a heart attack or myocardial infarction. In fact, more than 16% of people who have a heart attack, also have pain radiation to the upperarm (3). It is an emergency disease that must be diagnosed and treated in time to prevent serious consequences. Myocardial infarction occurs when the blood supply to the heart muscles is extremely reduced, causing ischemia of heart muscles. If untreated, the heart muscle dies and your heart function may be impaired forever. If you have any of the symptoms above you should get immediate medical help. Angina is defined as the chest pain or discomfort due to physical exertion and is typically one of the symptoms of a heart disease (5). Symptoms of angina may be like those of a heart attack (including left arm pain), but there is one significant difference. While there is a complete occlusion of a coronary vessel in myocardial infarction (resulting in cell necrosis - e.g. death), a coronary vessel is not occluded completely in angina and the heart still gets some oxygen supply. Due to this, the symptoms of angina do not appear while you are resting because the blood and oxygen supply is sufficient to keep your heart running. However, when you start doing exercises or some strenuous activity, the oxygen demand of heart tissues increases many folds. The only way to meet up this high oxygen demand of the heart muscles is by increasing blood flow, which is not possible due to the partial occlusion of a coronary vessel. Thus, the cardiac muscle lacks oxygen and you will get angina chest pain, possibly accompanied by other symptoms, including ache in left arm, sweating and shortness of breath. However, when you stop doing exercises for a while, angina and left arm pain resolve. Angina pain just lasts for 5-10 minutes and unlike the heart-attack related pain, it not persistent and is usually not associated with other symptoms like nausea, dizziness or light-headedness. A dull ache in your left arm, accompanied by shortness of breath and chest pain, which only appear with exertion and disappear at rest, may be symptoms of angina pectoris. You should get a complete medical check-up as soon as possible because negligence in the treatment of angina may increase your chances of getting a heart attack in future. The arm (mainly the shoulder and upper arm areas) is one of the most common injection sites. After the shot, you may feel some pain. So, if you were recently given an injection in your left arm, shoulder or hand, you might experience some left arm pain (6). Usually, it is nothing to worry about as the pain typically goes away in a few days. Post injection pain is usually associated with corticosteroid intra-articular injections but subcutaneous or intramuscular injections may hurt as well (7). If not, seek medical help. One of the most common causes of left arm pain is muscle strains or sprains (8). These occur while pushing or pulling heavy things, which causes overstretching of muscles, resulting in an injury or tear of muscle fibers. When your muscle gets injured, inflammation is initiated, which may cause pain, swelling and muscle soreness. Athletes and older people run a higher risk of muscle injury than the rest of the population. Aggravation of pain when you move your arm (cardiac pain does not worsen when you move your limb). Difficulty in shoulder movement (heart attack left arm pain does not affect joint mobility). Swelling and redness of affected area. There is no swelling or redness of arm in heart-related pain. Muscle stiffness is another typical sign of muscle injury and does not appear in cardiac pain. Mild muscle injuries won’t give you trouble as they heal on their own within 2-3 weeks. If you feel a muscle strain related ache in your left arm take some pain killing medication and seek a doctor if the problem persists and pharmaceuticals do not stop it. If the pain persists for longer than two weeks or if the pain does not go away with over-the-counter painkilling medication. In such case, you need a proper medical check-up to exclude a severe muscle injury, which may require surgical intervention. The rotator cuff is the system of muscles and ligaments supporting the shoulder joint. It keeps the shoulder joint stabilized and improves its mobility. Any injury or overuse of rotator cuff may cause severe pain in the affected (e.g. left or right) arm and shoulder (9). 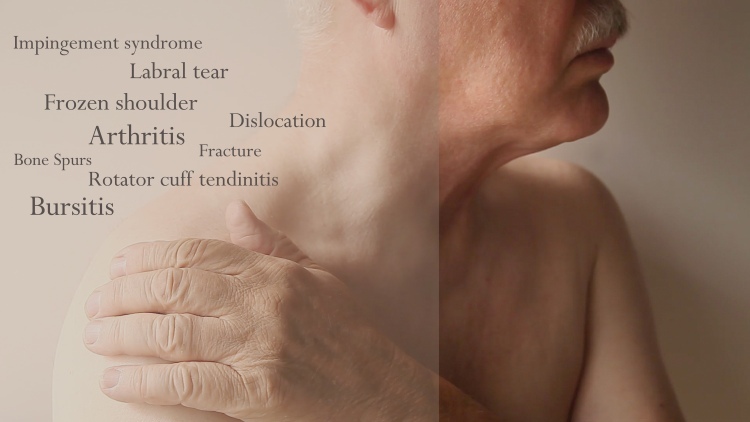 Some of the most common causes of rotator cuff injury are sudden overhead movements of the arm, heavy item lifting, falling on an outstretched hand, sports injuries and age-related wear and tear of muscle tendons. Also, some shoulder-related conditions, like impingement syndrome, labral tear, frozen shoulder, arthritis, bone spurs, rotator cuff tendinitis or bursitis and shoulder joint dislocation may be a cause of left arm and shoulder pain. If your left arm hurts due to rotator cuff injury, you should avoid strenuous physical activity or limb movement. Manage the pain by taking over-the-counter painkillers. If the pain does not go away or you get other symptoms, seek medical help immediately. Inflammation of tendons (tendinitis) may also be one of the causes of pain in your left arm. Tendon is a white fibrous cord that attaches muscles to bones and helps stabilize their movement (11). When your left arm hurts, you may have inflammation of your elbow or shoulder joint tendons. Tendinitis can either be acute or chronic (12). Acute tendinitis occurs due to repetitive or sudden movements of the joints or can be a result of a physical injury when lifting some heavy items. Chronic tendinitis is more likely to occur in older people or those having autoimmune joint disorders. Whatever the cause of tendinitis, both can lead to severe pain in your left arm. Movement of the limb may produce a crackling sound, called crepitus. If your left arm hurts due to tendinitis, you may relieve the pain by taking over-the-counter painkillers and rest. Tendon injury usually takes about 2 to 3 weeks to heal, depending on the severity of the problem. If the pain does not go away within a month or if your symptoms get worse, seek immediate medical attention. Inflammation of the bursa (bursitis) is another common cause of arm pain. Bursa is a "bag" filled with fluid, located between the bone and the tendon (or moving components of the joints). It prevents premature wear and tear of the joint. Repetitive movements of the joint may lead to bursa inflammation and pain. Usually, shoulder and elbow joints are affected (13). Symptoms of bursitis are like those of tendinitis, as well as treatment options. Rest and painkillers often heal bursitis in 2 - 3 weeks. If the problem persists, you should see your doctor. A group of nerves supplying your shoulder, arm and hand originates from a bundle called brachial plexus. Pain in your arm may be caused by overstretching, inflammation or compression (pinching) of brachial plexus (14). Minor injuries due to physical activity can usually be healed by taking painkillers and avoiding limb movements. Physiotherapy or surgery may be some of the treatment options for more severe injuries, such as nerve compression. Your spine is made of irregular bones with an "opening" inside (called vertebrae), intervertebral discs, ligaments and muscles. Inside the vertebra hole, there is a spinal cord with nerve roots supplying various parts of the body, including your limbs. In the case of a rupture of an intervertebral disc (e.g. herniated or slipped disc) due to trauma (injury), wear and tear or another underlying disease (such as cancer), the intervertebral space becomes smaller than typically and nerve roots are compressed (15). Nerve compression causes the pain, which usually starts in your neck and radiates down to your shoulder, arm and hand. This pain is often accompanied by a burning or tingling sensation in your limb. 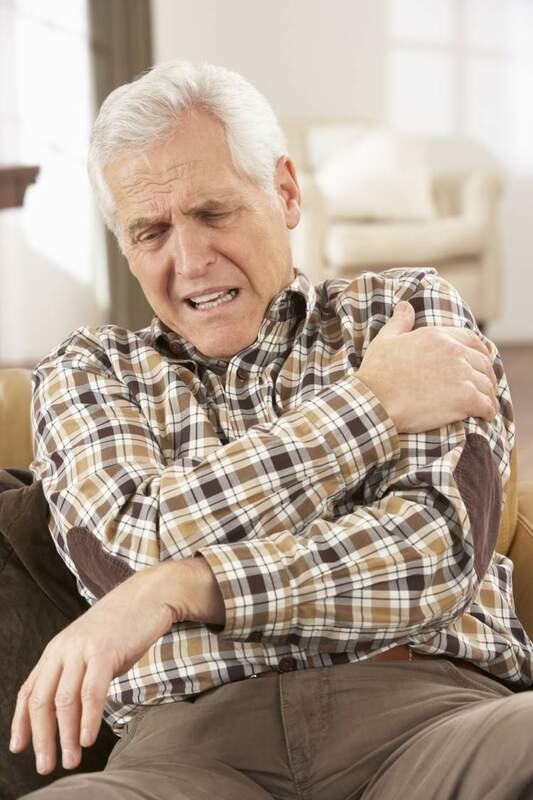 Your arm may also feel weak and numb and the pain gets worse when you attempt to move the arm. Cervical radiculopathy (pinched nerve) is a medical term for compressed or pinched nerves in the neck area. Its symptoms are similar to those of herniated disc, which is often the primary cause of cervical radiculopathy. Anti-inflammatory medication (Ibuprofen - Advil, Motrin, etc.) or corticosteroids (Prednisone) may prove useful in the treatment of a herniated disc and cervical radiculopathy. Other treatment options include physical therapy, cervical traction and surgery. Ask your doctor about the best treatment option. Thoracic outlet syndrome is another possible cause of left arm pain. There are two types of thoracic outlet syndrome - neurogenic and vascular (16). Both are caused by compression of anatomical structures under your clavicle or collarbone. Neurogenic thoracic outlet syndrome means that nerves under your clavicle are compressed (e.g. compression of brachial plexus - see above). Vascular thoracic outlet syndrome means that blood vessels under your collarbone or clavicle are compressed. Both types of thoracic outlet syndrome may cause arm pain, including numbness, weakness, tingling and burning sensation. It should be treated immediately by your physician as there is a risk of permanent damage if untreated. Carpal tunnel syndrome is caused by compression of the median nerve, which supplies forearm muscles, thumb, index finger, middle finger and half of the ring finger. The median nerve passes through a tunnel-like structure called carpal tunnel. When the median nerve gets pinched in the carpal tunnel, it may cause a dull ache in your fingers, thumb, hand, wrist, forearm and even the arm and shoulder (17). Carpal tunnel syndrome may also be associated with hand and arm numbness, weakness, paraesthesia (pin and needle like sensations) and burning. While sometimes the carpal tunnel syndrome just goes away without any treatment, if the problem persists, other methods are available, such as wrist splints, corticosteroid injections or surgery. One of the most common causes of left arm pain is a fracture or broken bone (18). Fractures may be extremely painful and you will not be able to move the limb. Fracture pain may be extremely sharp and severe, with the inability to move the affected limb. It is an emergency condition, which requires an immediate treatment (usually surgery or cast). There are lots of different causes of the pain in your left arm. The most dangerous and life-threatening event is when left arm ache is accompanied by symptoms of myocardial infarction, such as shortness of breath, dizziness, nausea, vomiting, excessive sweating or loss of consciousness. In such case, you should seek immediate medical attention. You should also see your doctor if the pain does not go away, if it gets worse over time or if you are unsure about your symptoms. Your doctor will examine you and diagnose the problem. To confirm (or exclude) the diagnosis of the heart attack your doctor will use an ECG (electrocardiogram), blood examination (troponin test) and other tests (19). To confirm (or exclude) other causes of left arm pain your doctor will take tests, such as physical examination, MRI (magnetic resonance imaging), CT (computer tomography), X-rays or ultrasound examination (20). Based on the results of these tests, your physician will suggest appropriate treatment options. The actual treatment depends on the cause of the pain. If your left arm ache is associated with a heart attack, you should expect a prolonged treatment, which may include coronary angiography, primary percutaneous coronary intervention (PCI), blood-thinning medication to prevent clotting, rest, etc. If your left arm is broken, you will probably need a cast or surgery. Sprains, swellings and muscle related arm pain may be cured by painkilling medication, limb elevation, rest and physiotherapy. You may also ease the pain by applying ice on the swelling or painful area (never apply ice directly to the skin but always wrap some ice cubes or frozen vegetable pack in a towel and press it against the sensitive spot). Left arm pain due to inflammation of bursa (bursitis) or tendons (tendinitis) may require antibiotics. You should always consult your doctor about available treatment options and never attempt to self-treat left arm pain as it may be masking a serious event, such as myocardial infarction or angina pectoris. Before we start, I just want to emphasize that you should always call a doctor or an ambulance if you do not feel well. Never attempt to treat anything on your own. The information below is just for information but the first thing you should do is call a doctor! It is very hard to differentiate the heart-related left arm pain from musculoskeletal pain, but you should know that left arm pain is not the only cause of a heart attack (21). A heart attack is usually associated with a sudden, dull chest ache that persists for more than 15-30 minutes and radiates in your left arm, neck, jaw or groins. Pain intensity does not change when you alter the position of your body or when you move your left arm. Also, the pain does not go away until you get proper treatment. Other symptoms of myocardial infarction include nausea, chest heaviness and shortness of breath. The pain develops gradually and may be sharp and tearing in nature. It is usually associated with arm swelling, inflammation, limb weakness or inability to move. Left arm pain caused by nerve entrapment (pinching) may feel, like a tingling or burning sensation, and is usually accompanied by numbness and limb weakness. The main difference between cardiac and non-cardiac left arm ache is that in the case of a heart attack the pain usually starts suddenly, remains consistent and does not change with movement of the arm. On the other hand, pain caused by musculoskeletal problem gets worse when you attempt to move the limb and goes away when you stop arm movement. If you get left arm ache while doing some hard work like pushing or lifting some heavy items, it may be muscle-related. However, a sudden dull chest pain radiating to left arm, which started while you were taking a rest or reading a newspaper may be associated with myocardial infarction. Constant left arm pain you may have for days or months is more likely caused by some chronic conditions, like arthritis. Your outlook depends on the cause of left arm pain. A heart attack is a serious condition, which may lead to permanent damage to your health or death even if treated correctly. Tendinitis, bursitis, rotator cuff injury, carpal tunnel syndrome and fracture can be extremely painful, but if they are treated appropriately, your prognosis is usually good. The best way to prevent left arm pain is leading a healthy lifestyle, which includes eating heart-friendly foods (to decrease the risk of a myocardial infarction), performing muscle exercises regularly (e.g. physical activity), etc. The best prevention of musculoskeletal left arm pain is learning the best practices for handling and lifting the loads. Causes of left arm pain include heart-related disorders, such as myocardial infarction or angina pectoris, musculoskeletal problems (e.g. fractures, sprains, rotator cuff injury) and nerve pinching or injury (e.g. herniated disc, brachial plexus injury, cervical radiculopathy, thoracic outlet syndrome or carpal tunnel syndrome). The most severe cause of ache in your left arm is a heart attack. In such case, the limb pain will be associated with other symptoms like dull chest pain, nausea, vomiting, sweating and shortness of breath. Seek an immediate medical help if you have any of the symptoms above.